My freshman year in college was at a small school of just 700 students in Wisconsin, and I worked as a breakfast cook from almost my first day on campus. Making breakfast for 700 students is a big deal, especially since we didn’t take a lot of shortcuts in the kitchen. Hundreds of eggs needed to be cracked and whisked, buckets of pancake batter mixed up and measured onto the griddle and flipped, mounds of potatoes peeled and fried, and everything else readied in the dining room – bins of cereal filled, endless gallons of coffee made, massive dispensers for milk filled, the waffle iron heated with a bowl of waffle batter nearby. I never once made myself a waffle there, although I wish I had. In college, I wasn’t very into breakfast, usually just drinking a cup or two of coffee and waiting for lunch. After getting up at 3:30 or 4:00 am and cooking breakfast, then mopping the floors and cleaning everything up, as well as prepping a few things in the kitchen for lunch, I went to class, already completely exhausted and wanting nothing more than to take a nap. It’s no wonder that I believed for years that breakfast wasn’t worth getting up for. I still like my homemade waffle recipes, and always freeze the leftovers to toast later. And that is when they’re actually perfect, emerging from the toaster all golden brown and crisp. I like to spread peanut butter on them, and the peanut butter gets all warm and melts into the crevices of the hot waffle. For something different, I decided to try making buttermilk waffles with brown rice flour instead of all-purpose, thinking that maybe the graininess would contribute to a crispier waffle. To be honest, it really didn’t seem to make a difference, although I did enjoy the chewy texture it added, and they also just happen to be gluten-free for those of you who need that option. In addition to swapping white flour for brown rice flour, I boosted the protein in these with more eggs than I would normally use in waffle batter, yielding a filling and satisfying waffle that wasn't too sweet. 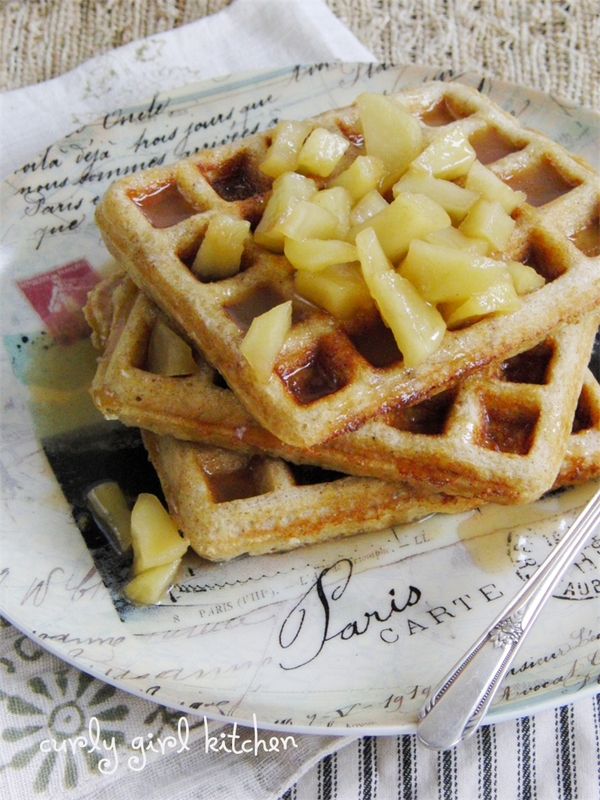 An apple cider compote - tart Granny Smith apples, spices and cider, simmered until thick and syrupy - was a wonderful Autumn finish to our breakfast of waffles. Pour the apple cider into a saucepan. Add the apples, cinnamon, brown sugar and butter. 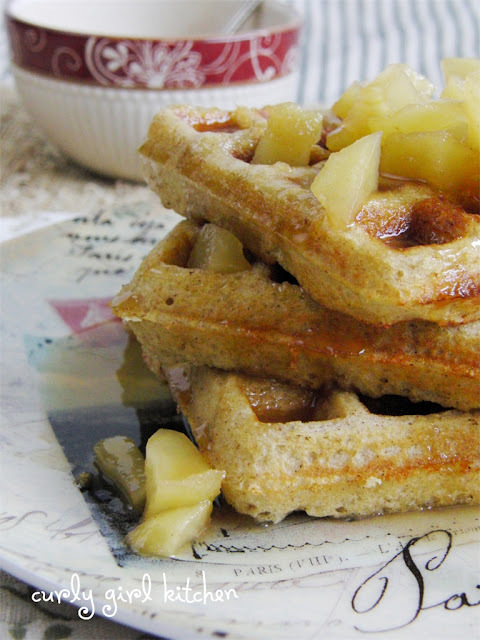 Bring to a simmer over medium low heat and simmer until thick and the apples are softened and caramelized. 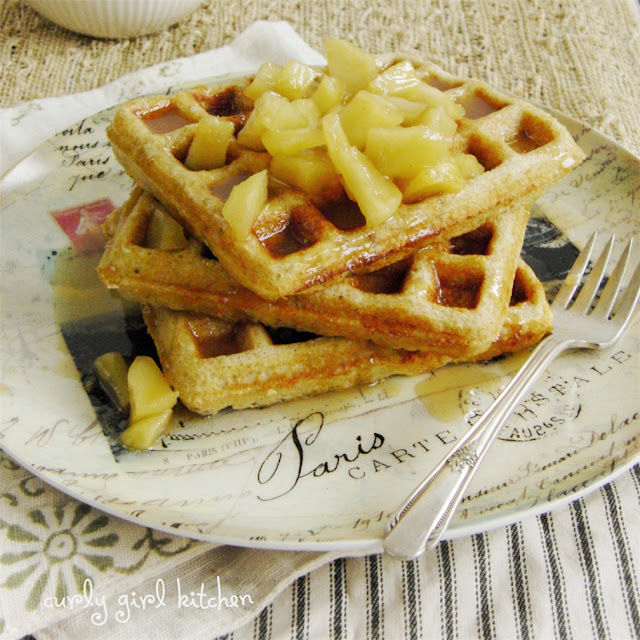 When the compote is nearly ready, preheat your waffle iron. In a bowl, whisk together the eggs, oil, buttermilk, vanilla and sugar. In a separate bowl, whisk together the flour, salt, baking powder, baking soda, cinnamon, ginger, nutmeg and cloves. Whisk dry ingredients into the wet and whisk until smooth. Pour batter into waffle iron and cook according to the manufacturer’s instructions. Serve with the apple cider compote. Yields 10 waffles, depending on the size of your waffle maker.